I will be giving a Spirit Book workshop at the Berkshire Botanical Garden on August 6. It is for adults but I thought I would mention it here. Wednesday, August 6, 10 a.m. - 2 p.m.
Connect with your creativity and the spirit of nature in this hands-on book making workshop based on the Spirit Book Series by Susan Kapuscinski Gaylord. 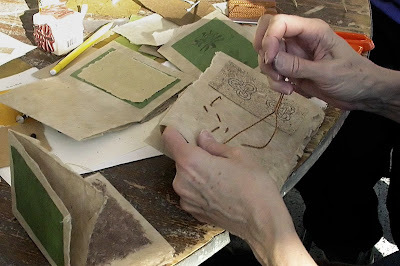 After an introduction to Susan's Spirit Books and a walk in the woodland, make a simple handmade book using Bhutanese paper, and add texture, imagery, and pattern. Susan's twenty years of teaching bookmaking have made her a clear and patient instructor. No art experience or creative confidence is needed; this workshop is truly for everyone. I'll also be doing a shorter workshop at the Art Complex Museum in Duxbury, MA in conjunction with the exhibit, Artists and Books, on October 26, 1:30-3:30 pm. You can find out more about the Spirit Books here.